Everybody likes Chris Goodman. Sure, he’s a little odd. He wears those funny bell-bottoms and he really likes the word ennui and he shakes your hand when he meets you, but he’s also the kind of guy who’s always up for a good time, always happy to lend a hand. 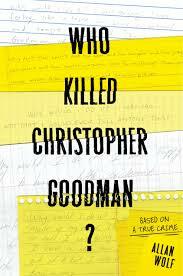 Everybody likes Chris Goodman, which makes it especially shocking when he’s murdered. Here, in a stunning multi-voiced narrative — including the perspective of the fifteen-year-old killer — and based on a true and terrible crime that occurred when he was in high school, author Allan Wolf sets out to answer the first question that comes to mind in moments of unthinkable tragedy: how could a thing like this happen?